Rockstar’s latest free update for GTA Online, The Southern San Andreas Supersport Series, adds a racing mode that feels like NASCAR on steroids. It’s some of the most fun I’ve had in GTA Online in a long while. 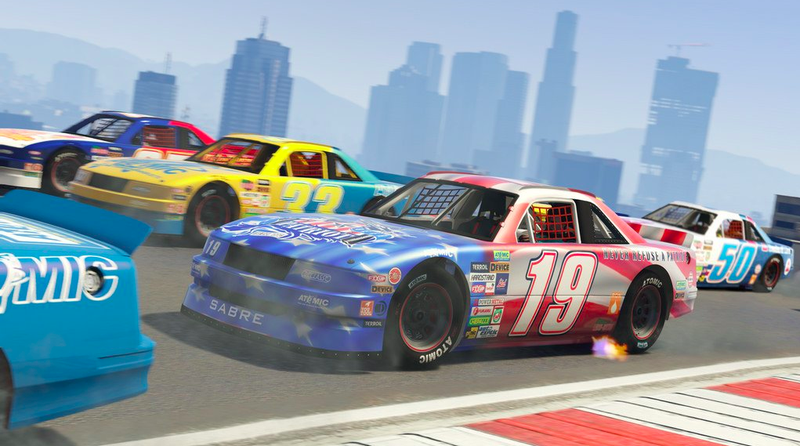 The new “Hotring Sabre” vehicle available in this update is inspired by the stock cars seen in NASCAR. It is also a classic and well-loved vehicle returning from GTA Vice City and San Andreas. While not as speedy as its Vice City predecessor, the new Hotring Sabre is exciting to drive. It feels dangerous and light, always ready to flip or spin out. I wouldn’t spend the $800k to buy it as my everyday GTA Online car, but in the new Hotring Circuit mode, the car is mandatory. 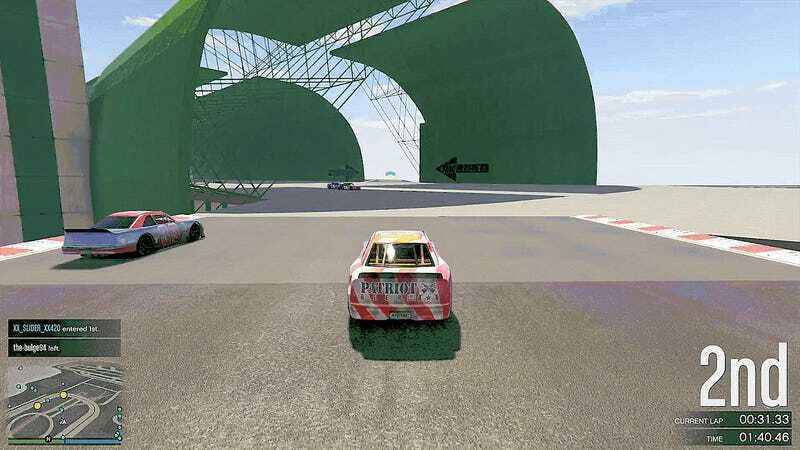 Hotring Circuit builds upon previous stunt races, but tones down the high-flying jumps and tight turns in favor of big oval tracks with huge straight sections and massive turns. This might sound less fun, but the longer straightaways and extra space allow for more strategic passing and bumping. Playing with a few friends, we even used drafting to slingshot each other around other drivers. There are a lot of drivers to pass here, as each race can have 30 racers on the track at the same time. With all these drivers even the best-laid plans and most strategic racing can be ruined by one person 20 cars up spinning out and causing a 10 car pile-up. This is GTA Online, however, so while many of the new Hotring tracks are filled with less jumps and other craziness, some tracks are packed with chaos. One of my favorite courses has drivers crossing over 4 different areas on one stretch of track. This led to a lot of near-misses and epic pile-ups, usually jumbling the leaderboard in the process. At one point I was in 22nd place and after a huge collision involving a bunch of drivers, I passed by and moved up to 13th. While many GTA Online fans prefer racing without catch-up, a feature that slows the racers at the front of the pack, I recommend playing with catch-up on in Hotring Circuit. Without it, races became really spaced out and players in the rear often backed out after the first few laps. I also prefered turning custom cars off: this is supposed to be stock car racing, after all. Hotring Circuit defaults to 7 laps, but you can turn that up to even more if you wish. At first I was concerned that races would take too long, but most tracks are relatively short and after a few hours I was bumping up the lap count to 10 or even more. I started to notice how certain drivers behaved at certain turns and even started developing grudges with other racers that would sometime spill over into the next race. You rammed me last lap? Well lap 6 I’m going to run you into the wall. Rubbing is racing. This is quickly becoming one of my favorite modes in GTA Online. I’ve always enjoyed stunt races and Hotring Circuit is a fantastic evolution of that mode. It’s fast and chaotic, but feels at times more strategic and personal than other racing modes in GTA Online. I’ll be playing more of it for sure and hope Rockstar and the community create more tracks for this new mode. Rockstar also teased what they will be adding in the coming weeks, which includes: a new vehicle partner focused assault mode, new transform and special vehicle races and some long requested track creator features. These updates are being spread out across the next few months.